It’s surreal watching a finale where most of the characters are crying or on the verge of tears almost non-stop, knowing that the episode is now the series finale instead of the season finale. Especially when that’s how the episode begins—the baseline is despair and hopelessness, and when you factor in that also happening for the series itself, it’s a strange feeling. While there’s technically hope for a second life for Lucifer, right now, “A Devil Of My Word” is the end of the line. And after a terrific episode in “Quintessential Deckerstar,” Lucifer lives up to the expectations set by it in tremendous fashion. In fact, the biggest problem with the episode is, understandably, the legwork it has to do in order to follow up the past Sinnerman arc and make it work. While the original mystique for the Sinnerman worked, the execution in “The Sinnerman”/“The Sin Bin” was so muddled that it really hurt the season, and the show understandably moved away from it. But as “A Devil Of My Word” makes clear, the Sinnerman story could’ve been more compelling had it been as laser-focused as it is here. That also means Pierce and his relationship with Chloe could’ve been more interesting, as the focus would’ve allowed for a regular reminder of just how bad he is, outside of the more selfish, manipulative aspects of his personality the show focuses on. The way the Sinnerman arc went down, the impression we were left with is that it was a two-person job, with Pierce’s partner (who I’ll call “Sinnerman Jr.”) going rogue with gruesome murder. Here, Pierce is the Sinnerman, he’s got henchmen champing at the bit to get to work, and he’s got friends in high and low places. In fact, he apparently has a network of thousands of people indebted to him. He’s genuinely intimidating. Knowing this about Pierce now, imagine the actual threat that would have been in the air had the audience been available while he was courting Chloe. There’s a taste of it in his handling and manipulation of Maze, but we truly don’t get to see the real Pierce—the one who’s a genuine adversary—until “A Devil Of My Word.” It’s a twisted joy to watch Tom Welling here, as Pierce evil laughs his way through everything, henchmen hanging all over him. When he’s not busting out crocodile tears, that is. You just want to see Lucifer and the team take down this scumbag. Pierce tells his henchman that he’s “more dangerous” because he’s finally afraid to die, for the first time in his life; and it’s actually believable, for the first time this season. Lucifer isn’t big with the fight scenes, but we get two solid and pretty badass ones. (Director Eagle Egilsson knows action, having also directed episodes of Nikita and Arrow.) Both fights are the physical manifestations of how far Maze and Lucifer have come this season, based solely on the reasons why they’re fighting. For Maze, it’s to make sure Linda’s safe, even though Pierce was bluffing when he threatened Linda’s life last week. The first thing Maze says when she wakes is “Linda,” and even though she’s clearly not at 100 percent—the tranquilizer that Pierce got her with was made for an angel—she’s still able to fight through a dozen henchmen and refuses to rest until she knows Linda’s “okay.” She’s fighting for a friendship she’d decided was dead, all because she couldn’t handle having to tap into her emotions. Until now, that is, as that’s literally the only thing that keeps her going in her fight against Pierce’s crew. For Lucifer, it’s to finish this Pierce debacle once and for all, to get him out of everyone’s lives, and to get justice for Charlotte and Chloe. While Maze fights through obstacles to get past the Pierce of it all, Lucifer fights through these obstacles to get to Pierce. And he does so while finally embracing his angelic form—as Maze has to embrace the more human, emotional side of herself—which makes the conclusion of the episode a twist of sorts. But before he does that, he verbally confronts Pierce to put the fear of the Devil in him. It’s actually a pretty chilling scene, until Pierce pulls rank on him. It’s also the scene with the key to this whole celestial thing, and while it’s disappointing Lucifer is ending with such a clear view for the future, it’s nice in a way for the show to end with such clarity. Despite the fact that Lucifer is not actually a bad guy, he still feels like a monster. He also identifies himself as the outcast of his family, and he plays that up. So when he loses that thing that make him the outcast (the Devil face) and regains his angelic form (wings), of course he wants to believe it’s a trick from someone else, whether it’s the Sinnerman or God. But as Lucifer tells Pierce, the real reason is much simpler: For the first time in a long time, he didn’t feel like a monster anymore, and that’s what actually changed things. That’s also why things haven’t changed back (until the end), because all of Lucifer’s “I’m the Devil” behavior has really only been performative, whether it’s going back to doing favors or trying to relive his and Chloe’s greatest hits. 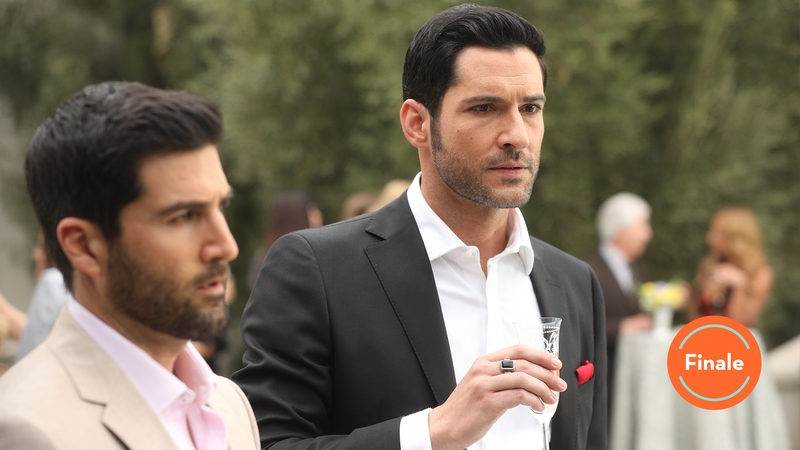 Tom Ellis is phenomenal in this episode, as a Lucifer with a drive and absolute sense of purpose is something the series has been building to. Lucifer has his moments like this, but so many of his grand gestures come with a chip on his shoulder. While no one is saying Lucifer is Team God now, a large weight has clearly been lifted when it comes to how he approaches life (no longer blaming Dad, whereas Ella’s upset with the Big Guy now), and it’s the same weight that allows Lucifer to finally embrace his wings. This is evident as he flies in for his awesome final winged fight entrance, but it’s especially true when he uses his wings as a shield for himself and Chloe. The screams of agony while bullets shoot into the Lucifer’s bloody wings is a lasting moment from this episode, especially since they amplify the already known information that cutting off angels’ wings is an extremely painful process. While Lucifer teases Pierce in his office and even right before their fight about his invulnerability, that’s not a factor when he has to protect Chloe here. I’ve written a lot about acts of selflessness (or lack thereof) in this season, especially when it comes to characters like Pierce and Charlotte, but it’s Lucifer and Maze—the show’s two “monsters”—who achieve the most selfless acts in this episode. And it’s all been a long time coming. In the end, Lucifer becomes the Devil again, as he does the one thing angels aren’t supposed to do, and kills a human. But even if God isn’t the one punishing Lucifer here, Lucifer punishes himself because he knows doing this one thing is monstrous. Lucifer isn’t a killer, just like he’s not a liar. Interestingly enough, Lucifer is all in on the plan to kill Sinnerman Jr. in “The Sin Bin” to get his Devil face back, but he couldn’t bring himself to do it. Only, it might have worked there, without a single lesson learned. Another performance I can’t forget to highlight is Kevin Alejandro’s in this episode, as he plays Dan on edge throughout every scene, never letting up. Dan spends the majority of the episode holding back tears, but you can tell he’s already cried a lot. And it takes literally all he has—which isn’t much—to keep from breaking. Lucifer’s able to turn Dan rushing him into a hug, and Dan is barely able to hide his contempt for Pierce when they’re in Ella’s lab, but by the time they realize who’s working for the Sinnerman, he’s so over holding anything in. This culminates in Dan’s speech to Pierce’s main henchman about being a corrupt cop. First of all, now the irony of Pierce calling Dan a corrupt cop is lost on no one. But also, as Dan points out, as much as he redeemed himself, he doesn’t actually regret the things he did as a corrupt cop. (Okay, maybe he regrets some Palmetto stuff.) It’s another scene that shows just how far Dan has come as a character, and Alejandro sells how much this character needs some form of justice for Charlotte, no matter the cost. As for Lauren German, she has a very difficult role as Joe Henderson’s script lays Chloe’s skepticism on thick in this episode (for reasons that become clear in the end). However, as “Quintessential Deckerstar” essentially solidified the romance between Chloe and Lucifer, Chloe has a right to react the way she does to Lucifer in this episode. Because now she’s opening herself up completely to him, and the Lucifer-isms she’s humored before (in terms of his elaborate “metaphor-filled” backstory) should be something he won’t have to do with her. And this episode hammers home just how much she’s humored him in the past, because Dan’s reactions to all of said Lucifer-isms when the trio is together show just how insane these things sound to everyone else. But by the time Lucifer’s saved them from certain death and left her on a roof, Chloe finally admits and opens her mind to the possibility that he might be telling the truth. Or at least something more than what she considers “his” truth. Just having that openness is what leads to her reacting to Lucifer’s Devil face in this way: “It’s all true.” All things considered, that’s the best immediate reaction she could possibly have at the reveal. The hard part is that it happens while a song featuring the lyrics “the beginning of the end” plays the show off. As a cliffhanger, it’s certainly frustrating to know the show is ending just as it’s opened up a whole new world of storytelling possibilities. And this isn’t just in the case of Chloe knowing Lucifer was telling the truth (and how that will turn out, especially for everyone else) but in terms of Lucifer finally stepping away from blaming God for all of his problems. That’s not to say it’s the end of the character’s daddy issues, but there’s already something new in a more enlightened Lucifer whose experiences and comparisons would and could come from a different place. At the same time, this and last week’s penultimate episode also close up a three-season chapter of Lucifer well enough that it’s still a beautiful way to go out. It’s certainly a mental Hell loop of an ending the more you think about it. Lucifer: “I’ll never get to see her again.” Lucifer says this about Charlotte early in the episode, and it hits me like a ton of bricks for a moment, because he was of course talking about in Heaven. And him telling Chloe that she would get to see Charlotte again... That’s just the beginning of the episode. After Lucifer teased him for the waffle maker, I’ll be damned if it didn’t pack an emotional punch when Dan saw it in Charlotte’s apartment. A poker game full of henchmen. I really wish we could’ve seen more of crime boss Pierce, especially if he hit every cliche in the book. The trio of Chloe, Lucifer, and Dan being known as “good cop, bad cop, sad cop” sounds about right. While there is no Trixie in this episode, it’s nice to know that Maze was actually supposed to babysit Trixie (so some progress had been made there) and Chloe was worried when she no-showed. Third time’s the charm this season when it comes to Lucifer and his unexpected Devil eyes. Only this time, it also brings forth the unexpected Devil face. In the other episode reviews, I’d written that these moments came at times of righteous fury against the guilty, and I’d say the same is true here. But at the same time, the guilty all looked at Lucifer like a monster in these moments—and Lucifer knew they saw him as that. Only Pierce really twists the knife, doesn’t he? This episode also confirms that Pierce only lost his mark because he was finally a selfless person for once in his life, when he decided not to use Chloe. But even though he goes on in this episode about how much he loved Chloe, it’s really clear he doesn’t understand love at all. Obsession, maybe, but Pierce is too much of a narcissist for love. It’s the difference between him and Lucifer, because while Lucifer very much plays at being a narcissist, he’s much deeper than that. Pierce isn’t that deep, even though he thinks he is. Just like he still thought he wasn’t going to Hell. Dummy. I’ll just keep it short, for once: I have absolutely loved covering this show here at The A.V. Club for most of its run. It’s a show I started watching for a combination of the cast and the whole “lol DevilCop” aspect, only to find myself genuinely invested in it and pushing for coverage here at The A.V. Club. It then became something truly amazing. I don’t know what the future holds for Lucifer, but I do know I have enjoyed writing about it and watching it grow and develop. No matter what happens, this show has been a regular delight, and the cast and crew deserve even more praise than I can give them.